Leading the life of a busy New Yorker, it’s easy to become self-centered and fail to realize the hardships of the people around you. 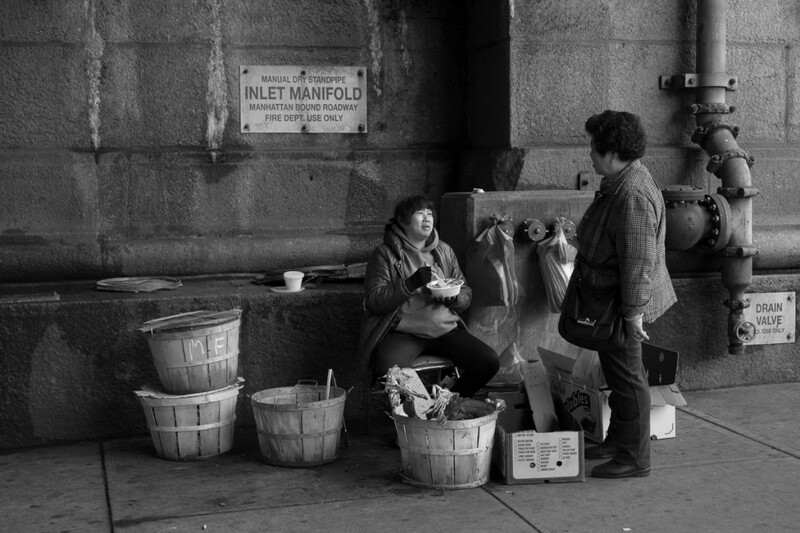 In Chinatown, many senior citizens still have to work in order to support themselves. Hour after hour, they stand outside trying to make a few dollars to put food on the table. Everyday, I pass by these people but don’t notice them. I don’t realize that they have lives and families of their own, with a life as bountiful as my own. This project served as my way of creating a bond with the disconnected strangers around me. Some of my photos showed a friendly, personable side of these workers; it reminded me that they too are people. In other photos, I omitted the faces of others in order to emphasize the lack of connection between the subject and me. I chose to put the photos in black and white to capture the essence of loneliness that is felt in observing these elderly workers. Through these pictures, I hope to show that there can be meaning to people and things that you walk by casually, if only you take the time to look.